Yesterday, I did something I never thought I would do. Ever. I’m scared of heights, am afraid of falling, and am not in the best shape. But, it happened. I went zip lining. 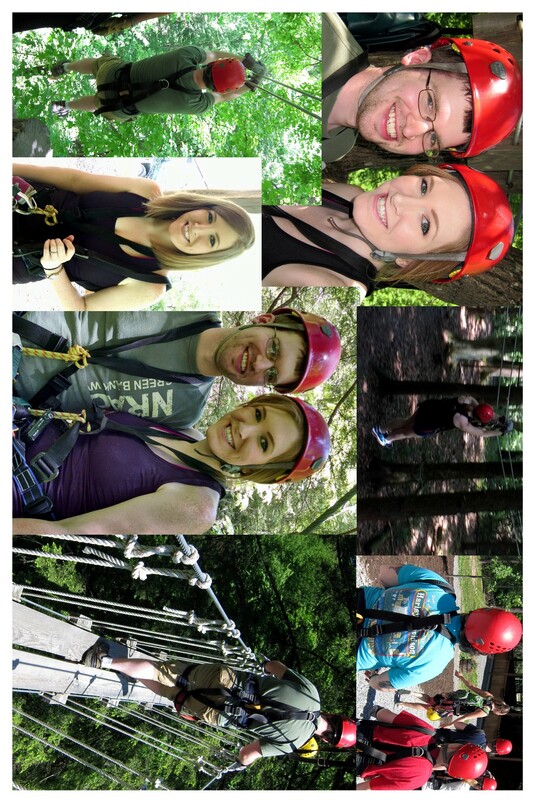 Although we had plenty planned for Memorial Day weekend, zip lining was not on our list. In fact, we didn’t have any plans for Monday aside from possibly going bike riding in Kanawha State Forest but even that wasn’t set in stone. But then Thursday night, I was browsing Facebook and noticed that Adventures on the Gorge in Fayetteville had a special for Memorial Day only: a 2 for 1 deal where you basically buy one zip line ticket and get one free. So of course, we couldn’t pass it up. The hardest part was deciding which zip line to do: TreeTops Canopy Tour for $99 or Gravity for $109. Both have high ratings and come with their own thrill, but you’re choosing between zipping from tree platform to tree platform (TreeTops) or mountain top to mountain top (Gravity). There really is no wrong decision, but since Jon and I had never gone before, we chose to do TreeTops as it looked to be the milder choice between the two per my in-depth YouTube research. And let me tell you — it was an excellent choice! TreeTops Canopy Tour consists of 10 zips, 5 cable bridges, and one rappel from the final platform which is approximately 35 feet up. Along the way, you’ll be one with nature as you zip to and from tree platforms, over Mill Creek, and along the hills. The entire tour will take 2.5 – 3 hours and you do need to be in moderate shape, as there is some hiking near the middle. Contrastingly, the Gravity zip line course is open-air and offers more scenic views of the gorge and mountains. On the longest zip, you’ll go 3,150 long (longer than the New River Gorge Bridge!) and upwards of 60mph. The fastest you go on TreeTops is 40-45mph. Cameras and a small backpack are allowed on both trips, but you must properly secure all your belongings. I brought my digital camera and looped it around my harness while Jon had his phone in his folding shorts pocket. For our trip, we chose the Noon departure of TreeTops and lucked out with two wonderful guides and a good group with 6 fellow zippers. Most of us were a little nervous at first but after a quick practice run and two shorter zips to get the hang of it, we were (mostly) all pros. It took some of us (ahem, me) a while to get the hang of braking properly but by the 4th or 5th zip, the training became second nature and the adrenaline took over. For me, the scariest part was rappelling down the final platform. I was terrified of that first step off the edge, but once I was caught in the weight of my harness, I was fine. Perhaps rock climbing school will be our next adventure? You never know. I know zip lining may not be for everyone, but if you’re interested in trying, I highly recommend Adventures on the Gorge. Their guides were knowledgeable, fun, energetic, and made sure that everyone felt comfortable no matter how nervous you were. This was the first time I’d ever booked anything with AOTG but I can tell you that it won’t be my last (and I plan on coming back for Gravity!). I’m trying to talk Jon into booking a rafting trip for my birthday in a few weeks…. we’ll see how that goes. Adventures on the Gorge is located just outside of Fayetteville, WV in the town of Lansing. They are a year-round resort featuring cabins, restaurants, and activities that include white water rafting, zip lining, a timber-themed obstacle course, and much more. 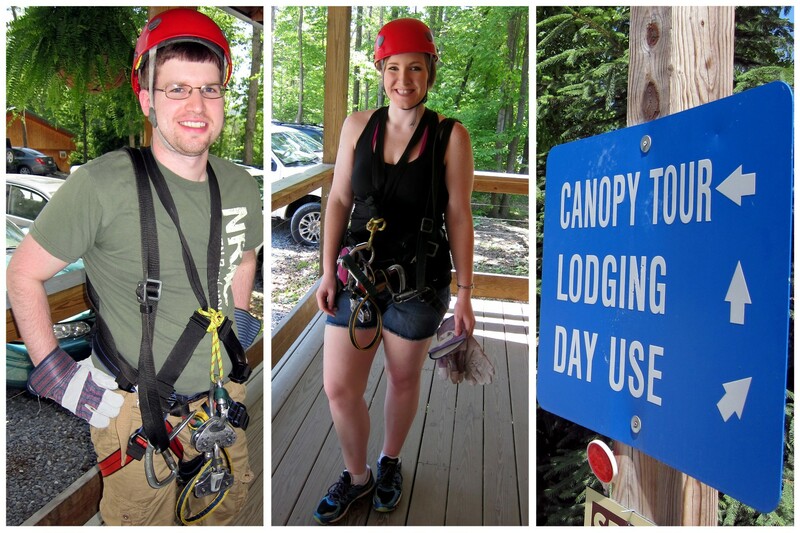 For more information on zip lining at Adventures on the Gorge, check out their TreeTops Canopy Tour or Gravity Zip Line webpages. Prices vary depending on the day and are cheaper mid-week. Note: this review is not sponsored or endorsed by Adventures on the Gorge. All thoughts expressed are my own and the trip was purchased with my own money.